This is the first of a two-part interview. Here Cathy and Fran discuss what went into creating and making the “Patient No More: People with Disabilities Securing Civil Rights” exhibit, the challenges and opportunities. 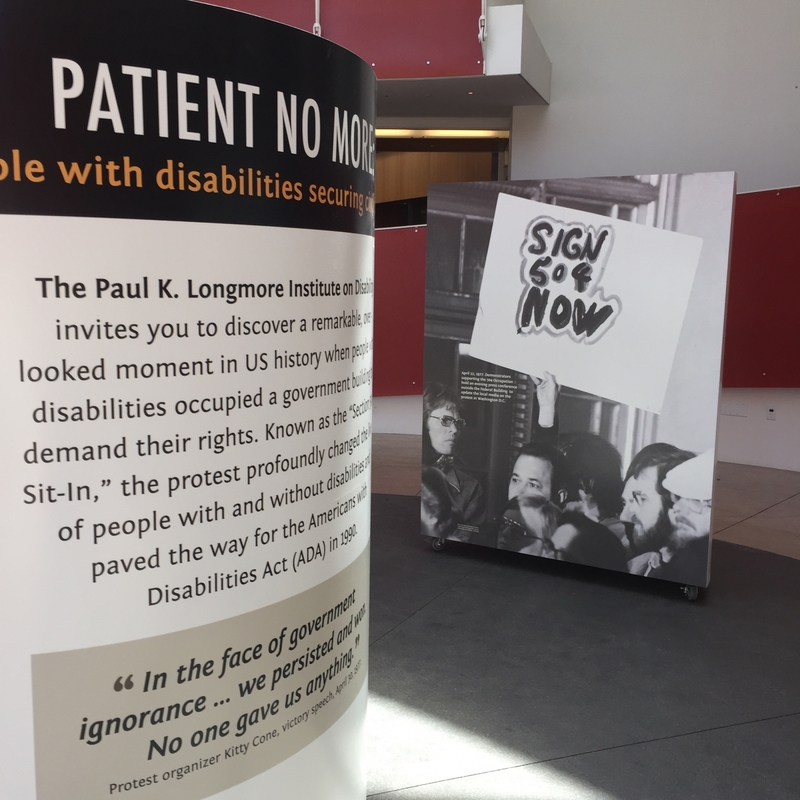 For the first time, an exhibit on the landmark 504 sit in, “Patient No More: People with Disabilities Securing Civil Rights,” will be shown July 26-December 18, 2015 at the Ed Roberts Campus, above Ashby BART at 3075 Adeline in Berkeley. The Disability Visibility Project interviewed Cathy Kudlick and Fran Osborne of the Longmore Institute on Disability at San Francisco State University about this exhibit. FO: The Longmore Institute wanted to create a memorable exhibition to mark the 25thanniversary of the passing of the ADA, without being a snoozefest of dry policy and explanations of the law. They wanted a project that would be exciting and powerful for the local community, as well as being relevant for a much wider audience. Our initial discussions began to tease out the most compelling stories and content, and we discussed how we could also fulfill the Longmore’s mission to generate new conversations about disability. Fairly soon into the process it became clear that the Section 504 sit-in had more than we needed to produce an exciting and resonant exhibition. What’s more, the protest was carried out for the most part by young people and may therefore have greater resonance online. We knew we could partner with many experts in the local community, that we could interview some of the unsung heroes of this amazing event, and that we might be able to find some photographs and other memorabilia if we kept digging. Cathy and Emily were also committed to experimenting with modes of access and building this thinking into the heart of the project.